Robert Ludlum’s The Holcroft Covenant: Is it worth the long read? As many of my regular readers and podcast audience members may or may not know, I am a huge fan of Audible which allows me to purchase audiobooks at a discounted price and listen to them wherever I am. This month I decided to use one of the two audiobook credits I receive monthly to get the audiobook version of The Holcroft Covenant by Robert Ludlum. The book was originally published in 1978, and was later made into a movie 1985. The story follows Noel Holcroft, a young architect who finds out that his biological father was a German S.S. commander that grew a conscience about the horrors of The Holocaust before the war ended. Noel finds out that his father left him a $7 billion fund which is to be distributed amongst the survivors of The Holocaust . Holcroft is also warned that a remnant sect of Nazi sympathizers and their offspring will try and prevent him from obtaining the money and will instead use it to start “The Fourth Reich”. 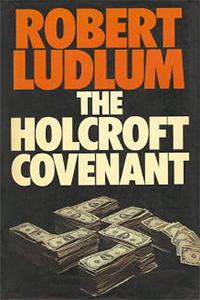 Continue reading Robert Ludlum’s The Holcroft Covenant: Is it worth the long read?